ST. GEORGE – On Saturday from 11 a.m. to 4 p.m., motor sports enthusiasts are invited to an event at the Red Cliffs Mall, hosted by St. George Street Bikes. The highlight of the event is a car, bike and truck show with cash prizes for winners. 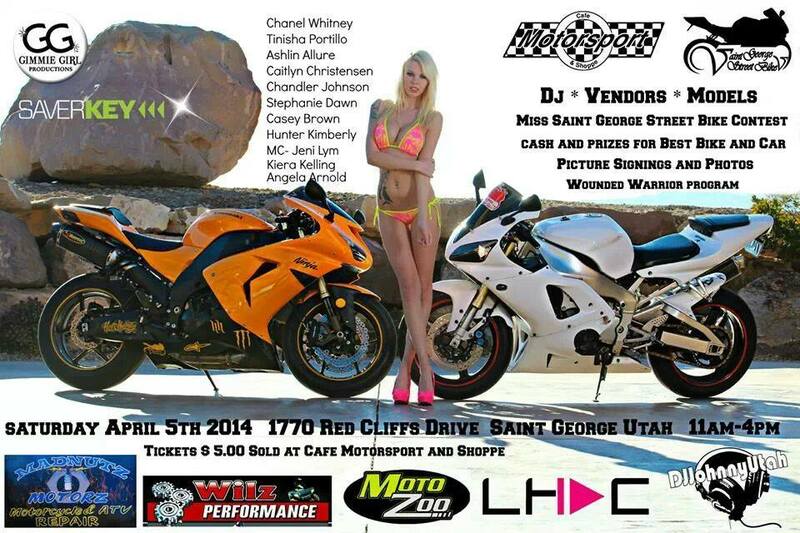 Lovely area models will compete in the Miss St. George Street Bike contest. Also, don’t miss raffle prizes and vendors with products and services for bikers, plus live music by DJ Johnny Utah. Tickets cost $5 and are available for purchase at the Motorsport Cafe & Shoppe in St. George. A portion of the proceeds will be donated to the Wounded Warrior Project. For more information, contact Benson at 435-773-1776.